Collagen Induction Therapy (CIT) creates small channels into the deep layers of the skin which break up the old collagen strands, and stimulate the creation of new ones. Although CIT may look a little aggressive, it’s actually much more gentle than you may think. This is because, unlike treatments like certain peels and laser resurfacing, CIT does not harm the epidermis. 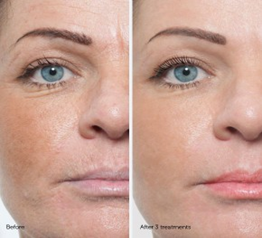 This treatment is a controlled stimulation of the skin’s ability to self-repair. Thousands of micro ‘channels’ are created in the skin, these channels trigger new collagen production but also allow any products applied to penetrate deep into the skin and heal the skin further. As the epidermis is only punctured, it heals quickly. Over a 3 to 6 month period the skin repairs itself naturally, and gradually the appearance of the skin improves dramatically. 1. Inflammation – This begins directly after the treatment, the skin is pink. 2. Inflammatory response – Healthy tissue growth is stimulated. 3. Tissue formation – The actual remodeling of healthy skin continues for up to 1 year. We didn't age overnight... So we cant anti-age overnight? !